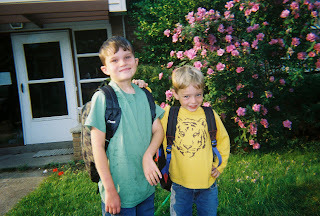 Photo: my two boys, smiling and ready for their first full day of third grade and kindergarten respectively. On the first day of school!" I think they might have made it up as they went along, although it is possible they may have picked it up from an educational cartoon. (Let me know if you heard something like that on television.!) Anyway, it's not a masterpiece of a song, but the cheery little ditty perked up the mood of this mom who was walking her baby to school for his first day of kindergarten. Anyway in a serendipitous moment, I found a post (via Tulip Mom's blog roll) by a mom, Jen at Absolutely Bananas, who wrote sweet words on the eve of sending off her little one for the first day of kindergarten. I couldn't have expressed my feelings any better than what her wonderful words did. Too cute! They look quite happy. I hope the week goes very well for them both. My son: Will you be my teacher? A Story About Our "Scooter Boy"